Though I have a background in science and am fairly analytical, nothing could have prepared me for the world of Process Control. There is a mind-boggling amount of testing performed and it is done constantly. Both accuracy and precision are critical to product release, quality, and revenue. Testing occurs via traditional chemical methodology or rapid techniques. An answer, preferably within the product’s specifications, is needed as quickly as possible so that production can continue. I quickly learned that any delay, questioning of results, or instrument down-time is unacceptable, as any of the three will ultimately cost the company money. In the dairy industry, there are two crucial components that are continuously tested and another that is rapidly becoming essential. Moisture/solids and fat content have a major impact on texture, quality, mouth feel, formulation, and product cost. Cream is sold based on fat content. Oftentimes, the more water that can be used without affecting the quality of the final product, the more cost effective production is because water is an inexpensive ingredient. Keeping tight control on the process makes all the difference. A tenth of a percent fluctuation in milk fat can add up to thousands of dollars annually. 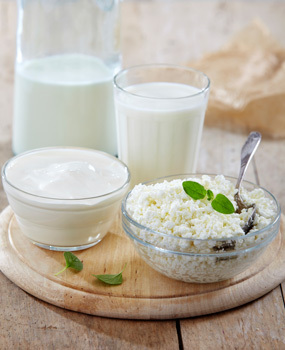 With the advent of consumer demand for higher protein products, such as Greek yogurt, protein is also rapidly becoming a component that is being tested more often, as it adds value to the final product and dairy manufacturers see increasing whey costs. There are several challenges with traditional chemical methodologies. First and foremost, they all involve long wait times for the results. The tests typically require the use of solvents that must be purchased and disposed of upon test completion. Each test can introduce experimental error with each different operator. Many times the solvents are environmentally hazardous materials that must be disposed of in the proper manner. They also require operators who are either trained chemists or who are very familiar with the methodology. Rapid technologies take much less time and generally reduce the amount of operator experimental error, though in the case of indirect methods, there are often expensive, time-intensive method and maintenance calibrations involved, in addition to a loss of accuracy. In the late 1970s, CEM pioneered the first microwave moisture/solids analyzer that was enthusiastically welcomed by cheesemakers because it was accurate and trimmed hours off of their moisture testing times. Since then, the company has developed a family of systems to improve compositional testing methods in a number of industries, but dairy has continued to offer major opportunities for new product development. 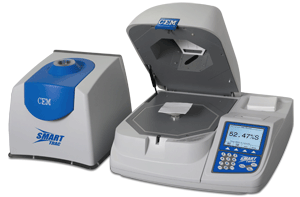 The SMART Trac II is a rapid method that can accurately and precisely measure the moisture and fat in dairy samples. Microwave energy enables rapid drying of the sample, while NMR technology determines the fat in only 8 seconds, without the need to maintain calibrations. The SMART Trac II works with a wide variety of dairy samples, including dairy products from start to finish. Results are available in 3 minutes or less and the system is simple to operate (spread the sample on a pad and place it in the microwave; when done, roll it up and place it in the NMR). Methods are transferrable from one machine to another, making it compatible with a long-term strategy of employing this technique in multiple plants. Using AOAC PVM1:2004, the SMART Trac II’s demonstrated accuracy and precision of the results is comparable to standard methods. (See dairy results chart below.) For more information on NMR and microwave drying visit CEM’s website. The SMART Trac provides moisture and fat, but the protein content is determined using the Sprint System. It can accurately measure protein in 3 minutes or less, without the use of hazardous reagents. (See Sprint vs Kjeldahl Results) The Sprint won the 2009 Presidential Green Chemistry Challenge Award for Greener Reaction Conditions, based on the substantial reduction of hazardous waste possible with the system. 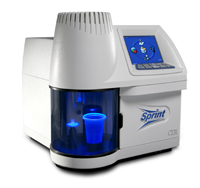 The Sprint is unique, as it combines the benefits typically associated with a rapid technique (no expert operator required, no hazardous reagents, rapid test), with the advantages of a direct method. The Sprint uses CEM’s proprietary iTag solution to bind directly to the protein in a sample, giving true protein readings, not total nitrogen, unlike traditional means of protein determination. Methods could also be transferred from system to system. One other benefit for both the systems is that set-up is amazingly simple. Only three samples are required to establish a calibration for the SMART Trac II or Sprint System. Once this method has been created, it will not need to be altered for the life of the product. No tweaking, modification, or weekly/monthly checks required, although operators can still perform monthly checks, if needed, for internal auditing purposes. They should be quick and painless with no need to update the method. While other rapid technologies are available for various types of dairy applications: NIR, FTIR, and FT-NIR, to name a few, they are limited in application. Each of the systems is capable of multiple component measurements. However, in order to test the full range of products, from incoming milk to completed non-fluid product (butter, cheese, ice cream, sour cream, yogurt, and more), two or more systems are required: one to test the fluid product and one to test the intermediate and final products. FTIR is limited to milk samples only, as the sample must be pumped through the system and volatilized in order to be analyzed. As a result, it is not suitable for any viscous liquid or solid product. NIR and FT-NIR rely on the external appearance of the sample. Slight changes to the formulation, samples that are not uniform, and seasonal changes can all require a different calibration or modification of an existing calibration, unknown until the product is suddenly out of specification. One advantage of a CEM System is the direct measurement capability, which eliminates concerns over these issues. The last point (and to me, the most important), is a comparison of data to see which system has the potential to provide the most accurate and precise result. In order to give a fair comparison, I looked for AOAC data comparing the different systems. All options examined utilize AOAC-approved methods. While limited data is available comparing rapid technologies using dairy products, there is an extensive comparison of precision and accuracy using meat products. As you can see from the tables below, the precision and accuracy from the SMART Trac II and Sprint was much greater than that from the other available rapid technologies. 1 Values for SMART Trac determined using AOAC methods; data reported by SMART Trac System.